with the fantastic Accelerant device. Are you tired of wearing braces for months on end? Do you want a quick fix that will straighten your teeth in no time? Then AcceleDent is what you are looking for. This revolutionary product can almost halve the time required to wear an orthodontic device. It is a device used to speed up the teeth straightening process. It is used in conjunction with other orthodontic treatments. It is a small device, which vibrates with the help of short pulse technology. This device is required to be used only for a small duration of up to 20 minutes daily. When you have braces, they are actually moving your teeth in a certain direction by exerting a continuous pressure on your teeth. The AcceleDent device is used to help speed up that process. It enhances speed by using vibrations. 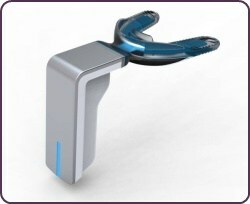 The technology used in the AcceleDent is short pulse technology. It gives short pulses to the bone and helps the bones move faster towards the desired position. The patient uses this device by placing it between the teeth. The device is then switched on to start the vibrations. The patient is asked to bite the device only with that much strength as is required to hold the device. Too much pressure may be harmful to the process. The patient is required to use it only for twenty minutes a day. This can easily be done while watching TV or reading the newspaper. Maintaining the hygiene of this device is easy, as it is not a permanent fixture. You just remove the mouthpiece from the activator. Clean the mouthpiece with soap or toothpaste and wipe the activator. Why should I use AcceleDent? This treatment is not a compulsory treatment. You will achieve your goal with the help of a normal orthodontic braces that you are already using. The advantage of AcceleDent is its speed. If a patient’s treatment plan has them with a brace for one year, the AcceleDent can almost reduce the time by half (case dependant). If you want to reduce your treatment time because of any reason such as an upcoming marriage, this is the best orthodontic complementary treatment for you. AcceleDent will add £495 to your total treatment cost. Call us today to arrange your free consultation and find out more information!